• File formats: Excel Spreadsheet XLSX, XLS, CSV. • 100% managed .NET component. • Doesn't require Microsoft Excel. • High performance (~50000 records per second). • Plain & Fair licensing. • Royalty-Free. No extra cost for Server license. • 6 Months: Free Support + Free Updates. New code samples. Fixing of excel formulas. The intensive study of excel format for cell numeric values. The comfortable work with Excel spreadsheet. Improved content formatting and image positioning. New formula functions in excel cells. Excel Image as a file. The Free version of Excel Jetcell .NET component is a FREE alternative to create Excel files. 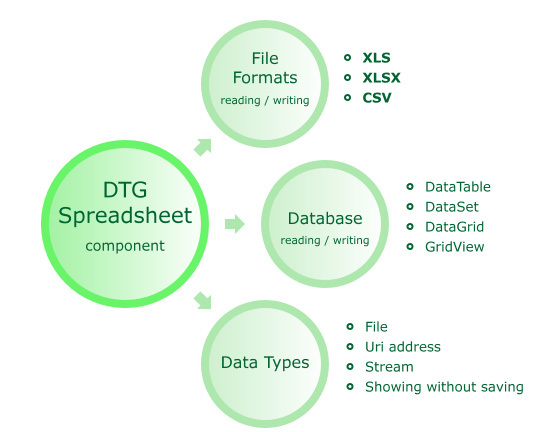 It is ideal for developer who are going to export only data to the Excel file. Read functions are not available. Excel cells have only values without format and formatting styles. The "advanced" features are disabled. Free version of Excel Jetcell .NET component can be used for any purposes, including use in commercial applications. It is required to acknowledge in applications that the component Excel Jetcell .NET Free version is used for specific purpose. It is required to provide link to this page or Excel Jetcell .NET component page. Excel Jetcell .NET Free component. Code Examples are a practical way to quickly learn the basics and advanced level features of Excel Jetcell .NET component.